I did find a place for that little bird. A new smock tunic for Miss Tilly. 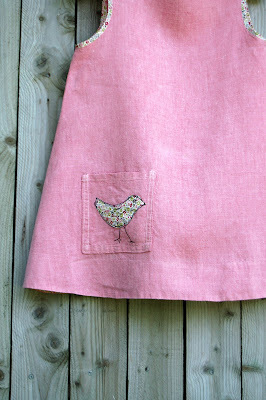 I am rather in love with this pink linen and if I was braver I might appliqué the bird directly on to the tunic but I'm not that brave and a girl needs a pocket. Thank you for all the good wishes regarding my Not On The High Street Shop, I am really hoping it will be a good thing. I have also tidied up my original shop, there are tea cosies available now and I have begun to list some things on Etsy too. Goodness, all this technology, I may have to go lie down in a dark room for a little while. 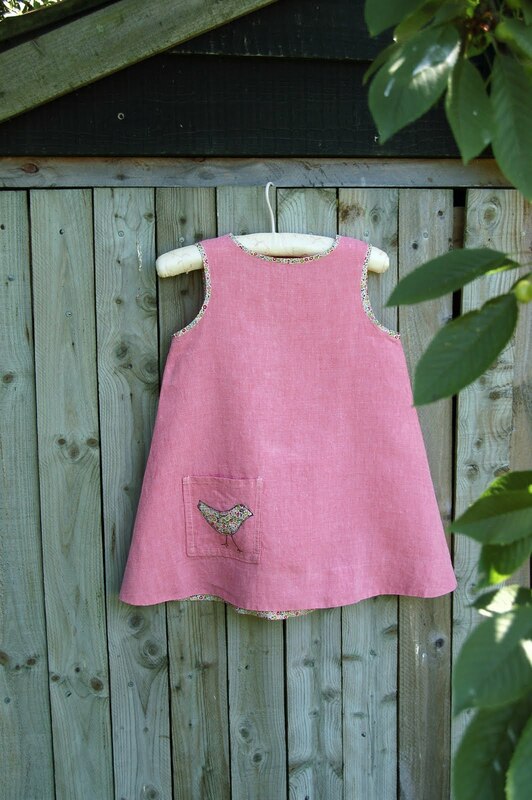 How beautiful, i have boys and sometimes would love to make girls things!! Hmm it does seem Tilly gets a few beautiful garments... I wonder if you would consider doing more stuff for the TA or Dylan perhaps? oh, boy oh boy oh boy! i SO wish libby were still in things like these! oooh, I also love that pink linen, antique rose...I do love miss Tilly's hair - I would have given anything for hair like that as a youngster! Oh, Rebecca, this is so, so sweet! A girl most definitely needs a pocket! And best of luck on all your shop ventures. So exciting! So cute. I love the birdie, perfect place for it because you see it all the time. She looks splendid in her little linen jumper. I love the color. You are so clever with linen. I've missed so many of your posts. Happy Summer Rebecca! I love these little, linen jumpers. Too cute. I'm so excited that you've decided to open up shop. I also think the pocket adds.